It is clear that the current trade conditions between the US and the European Union are not favourable for the former. 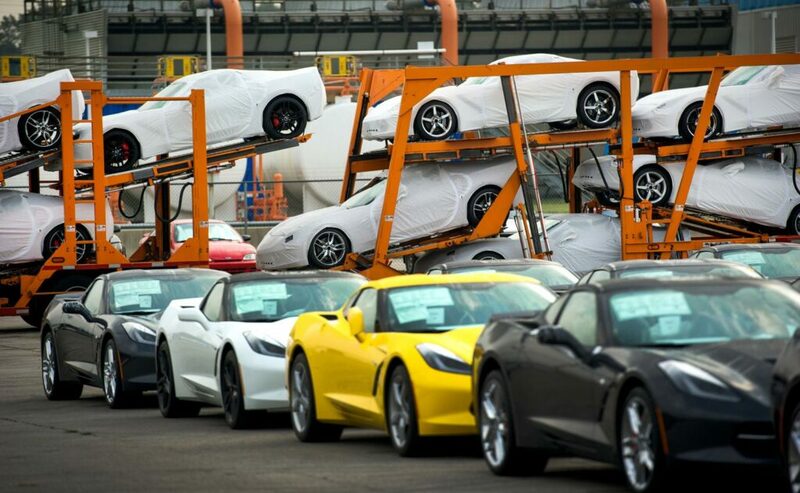 While the bloc exported 37.4 billion euros of cars to the United States in 2017, only 6.2 billion euros worth of cars went the other way. 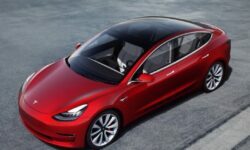 President Trump wants to reduce the deficit by increasing levies for cars entering his country, as the current 2.5% tariff may look too low compared to the 10% levy on US-made cars imported into the EU. One of Trump’s solutions is to impose a 20% tariff on all EU-assembled cars, which would certainly have a big effect on their sales in the USA. An increase is likely to happen, no matter the continuous warnings coming from Europe saying that it would be self-defeating for its own industry. This scenario would force the European automakers to add more models to their production plants in the USA, but at the same time would make exporting their cars from there more difficult. However, placing more taxes on imported European cars won’t solve the whole problem. Even if the difference in tariffs is reduced to zero, we would likely continue to see more European-made cars on US roads than the other way around. And this is something the whole American industry should think about. The poor appetite for “yankee” cars in Europe is mostly due to the gap between offer and taste. Or in other words, Americans don’t produce cars that consumers in Europe are looking for. Both markets are quite different in terms of taste. While Europeans have always preferred small cars and, more recently, small and compact SUVs, US drivers are more attracted to big SUVs and trucks. This difference explains part of the problem, as the focus of both parties is different. European makers don’t have the pickup know-how of Ford and GM, and these brands are not interested in producing small hatchbacks, at least at home. 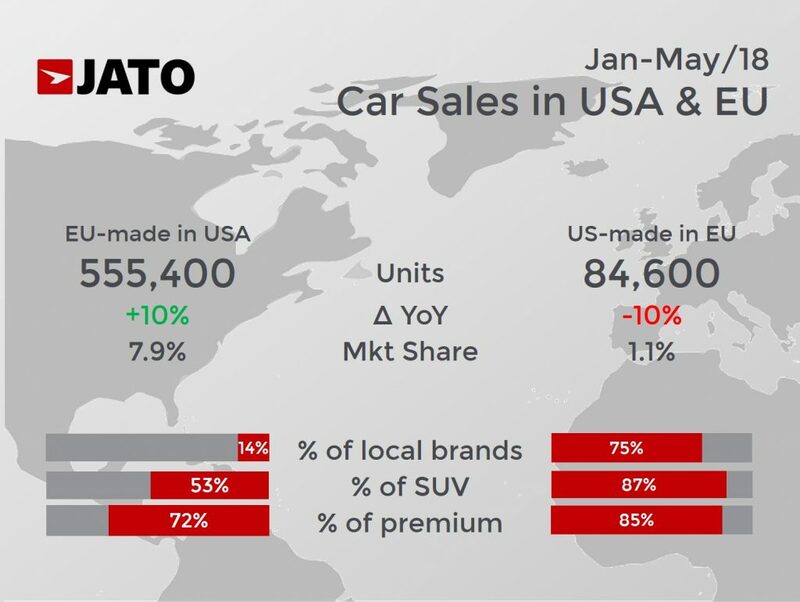 When looking at the sales of the cars in the EU coming from the USA, it is clear that US makers don’t lead the way. 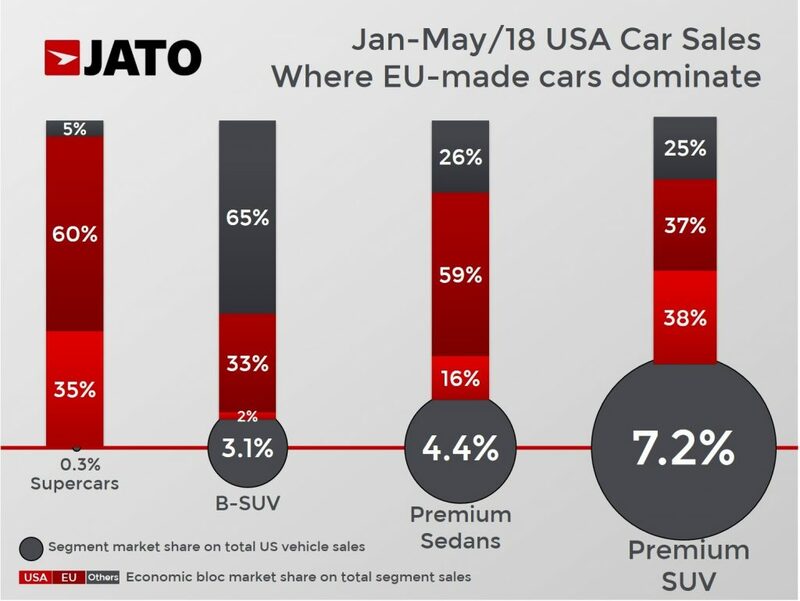 It means that the largest car exporters to Europe are not locals but foreign companies, or in other words, most of the US-made cars sold in Europe are coming from factories owned by European manufacturers and not from US makers. 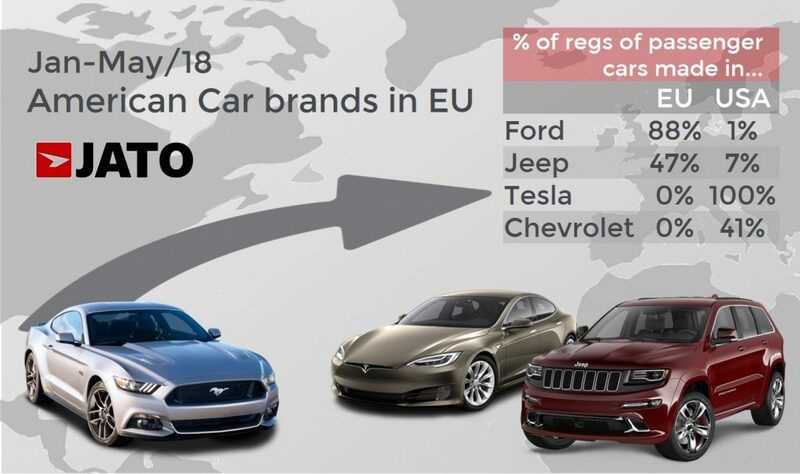 JATO data shows that 73% of total registrations of US-made cars had the BMW or Mercedes logo, against 27% of sales controlled by American brands (Ford, GM brands and Jeep). Therefore, any attempt to change the current status-quo would have a bigger effect on foreign companies investing in the USA and would do little to expand American makers’ presence in Europe. 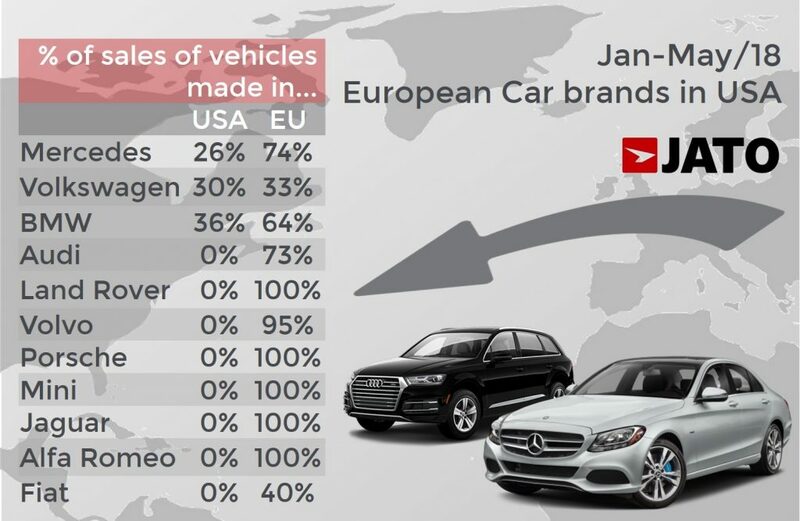 So, why do the US-made cars of American brands have such a small presence in Europe? Mainly because most of their key products are actually produced in Europe: The Jeep Renegade is produced in Italy, most of Ford’s models are produced in Germany and Spain, and GM quit the market last year. This leaves very little room for imports. And moreover, Ford and Jeep only import cars that have a limited sales potential. And that’s exactly what Trump wants: fewer imports and more local production. The problem is that by doing so, he is not addressing the other big issue here, which is the lack of competitivity of American cars. 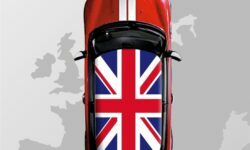 Europe, Japan and Korea have been able to supply both their local demand and abroad, thanks to the development of cars that appeal to most of the global markets. 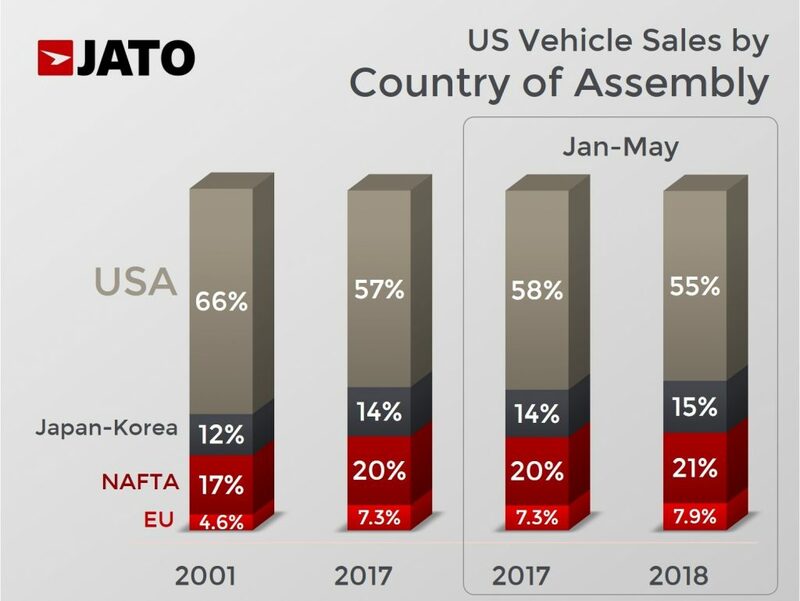 In contrast, the very few Fords, Jeeps and Chryslers exported from the US are either sport cars (with a limited demand) or big SUVs that may not fit on the roads of Europe, Latin America and Asia. Trump’s trade war targets mostly the premium cars, as they count for most of the imports from Europe. During the first five months of this year, 72% of EU-made car sales were premium cars. These cars counted for 47% of total premium car sales in the USA, against 29% of US-made premium cars. One of the most profitable segments in the USA (and everywhere else in the world) is currently dominated by European-made products. The government thinks it is because of the low import tariffs, but it is also because of the lack of offer of locally-made American premium cars. While Mercedes and BMW offer seven and six different SUVs respectively, Cadillac has only two available. A consumer can choose from six different sedans against two Lincolns. Even Japanese premium brands can offer a wider range of products. In addition, for many clients, a premium car is mostly associated to Europe, as Lexus, Infiniti and more recently Genesis, can confirm. However, things are changing and in the latest JD Power Initial Quality Study, Lincoln outperformed all of its rivals (except for Genesis and Porsche) in terms of the number of problems per 100 vehicles. Whatever happens to trade, car makers need to address other challenges besides tax structures. In order to succeed, they must improve not only the quality, performance and appeal of their cars, but they need to provide what the consumer wants. Even if trade conditions get tougher, at the end it is the consumer who decides and the final price is not the only variable he or she will consider.